When you have a business Jet that is flying well but is not as new as you would like it to be aircraft refurbishment is the solution for bringing it up-to-date. Refurbishing an aircraft does not address only the renewal of interior and exterior livery or the changing of old upholstery and materials. It can also include modifications that completely redesign the interior as well as modernization of an aircraft’s systems to streamline its overall performance. The cost of interior refurbishment varies greatly depending on the wish list. Private jet owners must first decide whether the aircraft needs a full or partial refurbishment. Owners that have high expectations for a new look on a smaller budget could be gambling. Before deciding on the scope of the refurbishment or modification, we recommend defining who will be the primary user of the aircraft as well as the main purpose of use (personal or corporate flights). It is also important to take into consideration whether or not the aircraft will be chartered or used in any similar way. Only then will designers be able to develop an optimal solution that takes into account the balancing of vista visuals and the requirements for materials (such as seat and carpet designs or installing LED Lighting) to meet interior durability demands. There are many available easy to complete and cost-effective solutions that are just plug-and-play. Separating lists into wants and needs is always beneficial. If considering a recently purchased used aircraft that has just had major maintenance inspections completed, we recommend thinking about a partial refurbishment. Rework needed items first and schedule complete interior, livery changes, or glass cockpit modifications for the next major inspection. We do not suggest selecting a highly customized interior solution with non-standard materials such as exclusive carpets or fuzzy colored seats. Materials such as these will cost much more than expected over a lifetime. We also recommend buying extra material for future interior maintenance needs to avoid the long lead-times for custom re-orders. 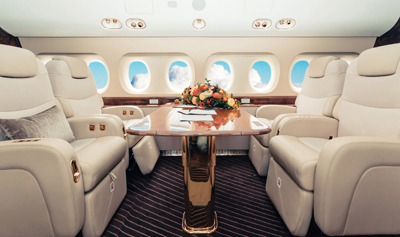 Instead of glossy and overdone interior designs, private jet owners should also think about internet capability before refurbishing, buying, or selling an aircraft. A vast majority of private jet users want this feature present during their entire flight no matter the duration as it is a part of our daily living standard. So, internet connectivity brings a higher competitive advantage to charter companies and will bring added value to aircraft when considering selling options. Scheduled maintenance events are the ideal time for interior updates, the installation of the equipment required for internet connection, or an upgrade of the existing connectivity equipment. Jet Maintenance Solutions has developed an extensive knowledge base through years of experience in this field. Our engineers and project managers ensure that clients receive the help needed to properly set up a plan that gives business jets a fresh new look with added functional capabilities on the lowest budgets without extending downtimes.